Pull 2 cables at one time! 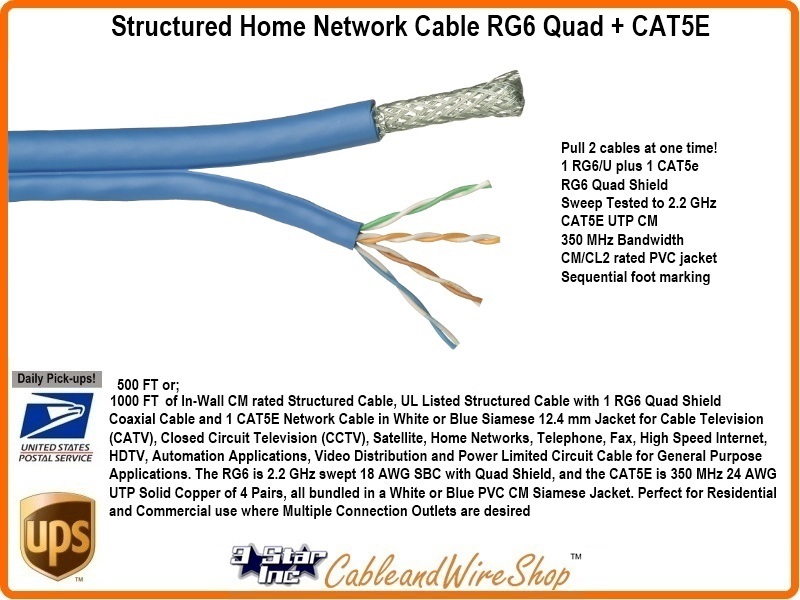 1000 Feet of In-Wall CM rated Structured Cable, UL Listed Structured Cable with 1 RG6 Quad Shield Coaxial Cable and 1 CAT5E Network Cable in Blue or Orange Siamese 12.4 mm Jacket for Cable Television (CATV), Closed Circuit Television (CCTV), Satellite, Home Networks, Telephone, Fax, High Speed Internet, HDTV, Automation Applications, Video Distribution and Power Limited Circuit Cable for General Purpose Applications. The RG6 is 2.2 GHz swept 18 AWG SBC with Quad Shield, and the CAT5E is 350 MHz 24 AWG UTP Solid Copper of 4 Pairs, all bundled in a White or Blue PVC CM Siamese Jacket. Perfect for Residential and Commercial use where Multiple Connection Outlets are desired. Though Structured Cable Products and Home Network Wiring is Bundled Together for Economy in Space and Ease of Installation, the Component Cables and Wires should still be treated as Individual with the Systems to which they belong as compared to the Whole. No One System should be Sacrificed to serve the Needs of Another. When Preparing Terminations, Leave Plenty of Tail before Prep, and Plenty of Spare to Coil after. This will Serve Future Expansion Well. Most Manufacturers know the limitations of the Individual Wires and Cables their are Bundling, Make Sure you do too. It is Especially Important to Approach Installation as the Most Fragile of Companents as the Major Consideration. Do not Force the Issue, If It doesn't fit, Be patient enough to Figure a Work-Around. A properly prepared Communications PVC Conduit route involves sweeps, not 90 Degree bends, and as few as possible. The size of the conduit should be 4 times that to be occupied. Install with MuleTape already inside for ease of pull-through. Do not under any circumstances colocate communications circuits with power. Even in Conduit, power circuits and routings should be crossed at 90 angles of intersect as to avoid field induction. If your routing has to be parallel, consider 2 feet to be minimum distance if either is shielded, 4 to 6 feet if not. Comm circuits should avoid flourescent lighting at all costs... The fields generated from the ballast transformer and even the bulb will wreak havoc on todays micro-circuits. There are Panel Box Systems made for central inter-connection of Video, Telco, Internet and Intercom. Regardless of manufacture, they are pretty much standardized in the block-out of space inside, and the installation of the Modular blocks of Termination and patching. Again, AC power for the systems should remain outside the panel, with either the transformers plugged into the outlet and DC running through the bulhead inside the Panel, or the standard AC plug running through a bulk-head to the outlet outside the Panel.